The rise of Solid State Drives is making regular hard drives obsolete in almost every way conceivable, and TDWS is here to shed some light on the situation. SSD Hosting is the future and here’s why. 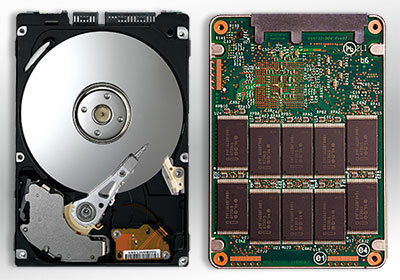 Solid State Disk drives use non-volatile memory to store information. Unlike regular volatile memory (RAM), this means that the data isn’t lost when power source is removed. The traditional drives need to spin their magnetic disks to locate data before any operation can be done with the date – SSDs don’t have mechanically moving parts, so seek times (the time it takes to “locate” your data on the drive) are up significantly faster. In terms of raw I/O performance, testing showed Mbps (megabits per second) of transfer under heavy load to be double or greater compared to enterprise class Mechanical hard drives – one SSD can achieve the same throughput or better than a 3-disk RAID 0 array. In summary: better core performance, faster database queries, faster caching – that’s a winning formula for more traffic, more sales, and more revenue. What are you waiting for? The benefits of quicker data access for your server is obvious, but there are particular highlights to modern data-driven sites that dynamically generate pages from countless of database queries. The difference is in raw data access times, compared to a regular hard disk, it’s measured in milliseconds, but when your site is being bombarded by high traffic, those milliseconds can make all the difference! Unlike Hard Disks, which can just fail suddenly, resulting in total data loss, the nature of anything mechanical has a higher rate of failure compared to electronics, SSDs simply prevent further write access at their end of life, while the data stored within it can still be read. The lack of moving parts also means they’re less susceptible to shock or vibration damage, and thermal output. Use cases: Where are SSDs crucial? It is particularly important for dynamic data-driven websites, those with high traffic, the access time – the time is takes to locate the data area before it can be operated with, is crucial. Inspecting various benchmarks, with Hard Disks, this can vary from 15-20 milliseconds, while SSDs can perform as quick as 0.2 milliseconds. It’s obvious, in a world where milliseconds of the response time of a website are critical, SSDs offer an undisputed advantage. HDD vs SSD: mechanical storage media is quickly becoming obsolete. RAID is, of course, a Redundant Array of Independent Disks. It is a method of storing information on multiple hard disks for greater protection and performance. Put RAID 1 and RAID 0 together and you get RAID 10. RAID 10 is secure because mirroring duplicates all your data. It’s fast because the data is striped across two or more disks, meaning chunks of data can be read and written to different disks simultaneously. RAID 10 is fast and it’s crashproof. If you need more protection for your storage, or faster storage performance, RAID 10 is a simple simple solution. most of the players are just giving SSD, We are having the RAID 10 config, giving our SSD Hosting a 25% boost in performance and Data Redundancy! A closer look – Everything sounds good in theory, but how do numbers add up in practice? Operating a large blog, an e-commerce store, or a custom application that requires a lot of database input and output (I/O), as your site gets more popular and traffic increases, your storage will receive corresponding concurrent I/O requests. In peak viewing times, the amount of I/O requests can slow down the recall of information from your database. The physical limitations of mechanical HDDs restricts the amount of information that can be requested. This is where TDWS packages that offer SSD storage are superior. With no moving parts, to restricted the speed of the network,we’ve benchmarked our SSDs against mechanical hard disks and, as expected, SSDs massively out perform hard disk drives on I/O transfer. In benchmarks, we tested our fastest drives against 1TB Samsung solid-state drives during busy I/O periods. 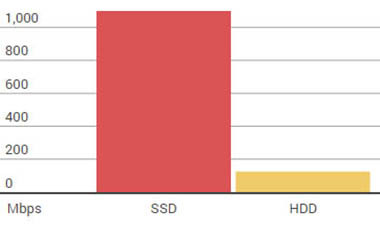 The result, SSDs hulled over 90% more data than these hard disk drives! Mechanical Hard Disks have two things not working in their favor when it comes to data retrieval. The first is the rotational latency of the of the disk. The second is the seek time that it takes for the read/write head to find the data on the disk. SSDs have neither of these problems. In the second benchmark, we compared the latency of our SSD hosting servers versus a regular HDD server under enormous network load. It’s obvious, HDDs take about 20 times longer to access data in times of heavy I/O requests. In short: SSD is the future! Although for smaller sites and apps regular HDD hosting might do, with the unstoppable rise and development of the internet, it takes just a good idea to make a business boom! 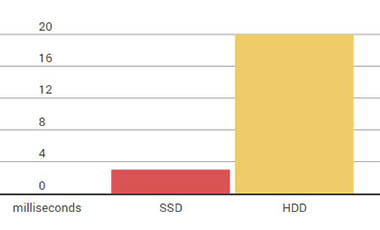 That’s it wise to switch to SSD hosting as soon as possible. Why put performance and your business in jeopardy, when you can reap advantages of the SSD. Check out TDWS packages that are SSD enabled and evolve your business today! We don’t believe in offering you “unlimited plans” that require costly upgrades in order to meet your expectations. All Business Hosting options are hosted on RAID 10 SSDs! Our shared hosting packages match these needs giving you the secure, reliable platform of your very own private server. This service is 100% SSD Raid 10 enabled! Fast, scalable hosting for high-traffic WordPress sites. When you hit high trafic, your RAID 10 SSD Storage will turn that bothersome heavy load in a worry of the past.